I recently had to remove the trunk handle from my car to have it rechromed. Then I had to disassemble it before chroming. The car I am working on is a 1948 Pontiac Streamliner. This procedure may also be good for 1942 through '48 Pontiacs (it may also work for all GM products for that period but I don't know for sure). Armed with a shop manual, a Fisher Body catalog and a camera I decided to jump in. The shop manual gave me just enough info to get me started but after that I was on my own. If there are any other similar trunk handles out there that need rechroming, but have not been done because they appear to be difficult to take apart, I hope this helps. 1 Remove the handle/lock from the trunk license plate holder by taking off the hex nut on the inside. This will allow you to pull the handle out. 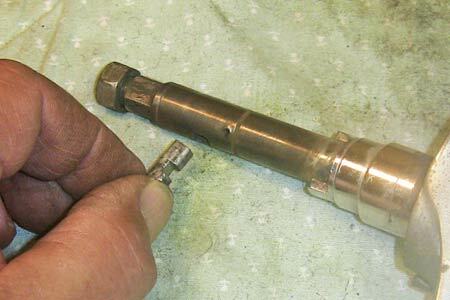 2 Take note of the position of the key cylinder and the square locking pin in the end of the shaft. When the mechanism is LOCKED the square pin is protruding down and the key slot has the round part facing upward. When the mechanism is UNLOCKED the square pin is protruding up and the round part of the key slot is facing down. 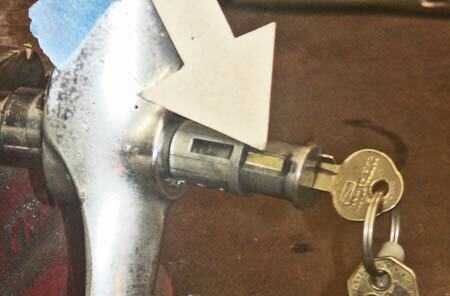 Also, the key is unable to be pulled out of the cylinder when the handle is unlocked. This is normal. 3 At some point you are going to need to remove the tear drop shaped key cover so you might as well do it now and get it out of the way. 4 The cover is held on with a stud from the back side. 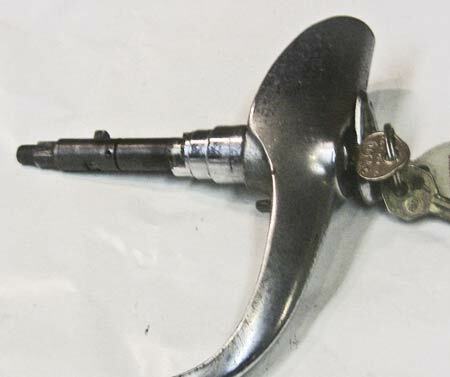 There is a spring behind the head of the stud which gives the cover tension. You will need to grab the head of the stud with a pair of needle nose pliers. 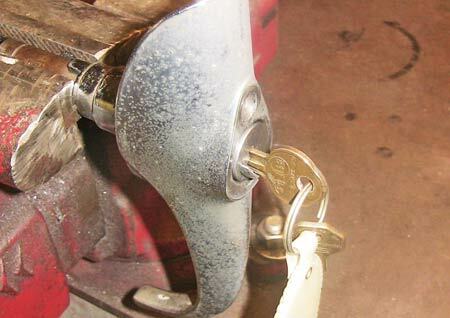 If you have the kind that lock (vise-grip type) use them. 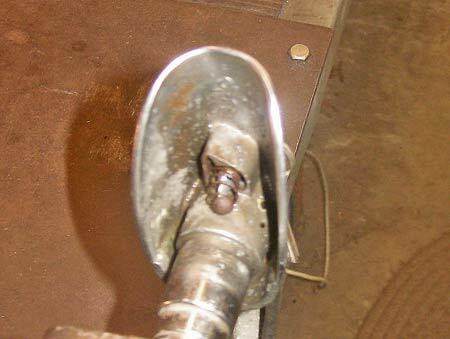 You will need to grip the head of the stud as tightly as possible and turn it just like you were unscrewing a bolt. This stud is not a "threaded" bolt but it does have spiral serrations around it so once you get it to start backing out it will come out fast. (It would have been nice if GM had put a slot in the head of the stud. That way you could have used a screw driver to get it out. Of course, when GM installed them 60 plus years ago they didn't think any fools like us would ever be taking them out.) 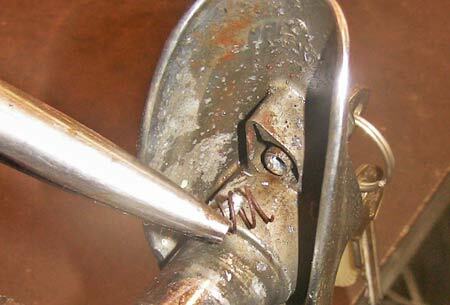 It is best to clamp the shaft of the handle in a vise because you will need all your strength to twist the stud. 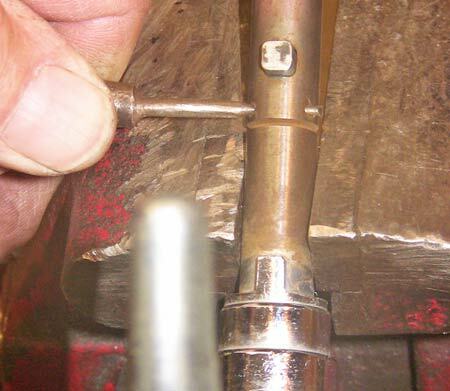 Once the stud is removed the spring and cover will come off (The first person that finds a spring that is not broken wins a prize). When it comes time to reassemble the cover a drop of lock-tite on the stud will help prevent it from coming loose. All you need to do is tap the stud back in. 5 You will probably need to take some steel wool to clean up the shaft. You are trying to locate a very small pin that goes through the shaft. I could not see mine no matter how hard I looked until I cleaned the shaft. 6 Once the pin is found you will need to use a very small punch to drive it out. 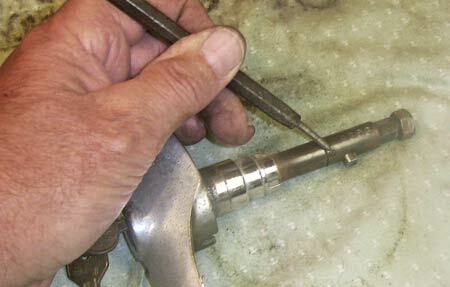 7 Now remove the snap ring on the outside of the lock cylinder where the key gets inserted. Use a small screw driver and gently lift it out. There is a spring on the inside pushing the cylinder out. When the snap ring is removed the cylinder will move out a bit. This will cause the square locking pin on the end of the shaft to fall out. DON'T LOOSE IT! Note the orientation of the square pin. The slot faces the handle end. 8 At this point the lock cylinder should pull out. You will need to insert the key. This allows a tab on the inside to be depressed and allows the middle of the cylinder to pull out from a sleeve. However, for some reason mine did not pull out easily. I found that by turning the key and gently but forcibly pulling on it the cylinder did come out. I don't know if mine was an odd ball but it did not just pull out. 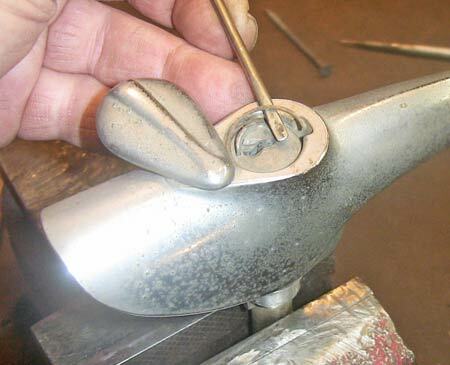 I had to grab the tab that sticks out of the cylinder with needle nose pliers and pull on it and tap the pliers gently with a hammer while holding the shaft of the handle tightly in a vise but eventually it came out. The arrow is pointing to a brass tab. It is this tab that holds the cylinder in the sleeve. 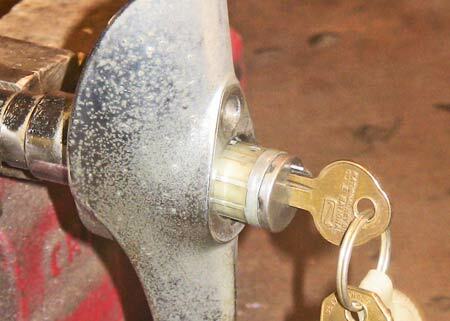 When the key is inserted all the way in the lock the tab is depressed an allows the cylinder to come out. 9 Once the cylinder is out there is a spring inside that needs to be removed. 10 You should now be ready to take the pieces to a chrome shop. Use caution and only chrome the areas that are chromed now. Otherwise you may not be able to reassemble the handle. 11 Captain obvious here saying after chroming is done reassemble the lock/handle in the reverse order from the above. There is one thing that is not so obvious. 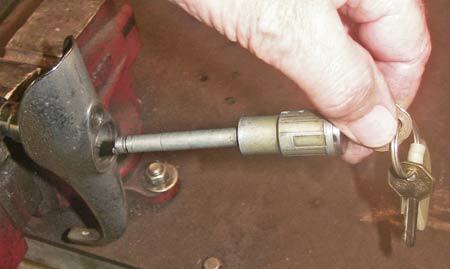 When reinstalling the small pin into the shaft make sure it is tight after you drive it into the shaft. You may need to "stake" it on the ends. You don't want it to slide out once installed. That may cause the lock to bind up and not work properly. It is also a good idea to lubricate the lock at this time with some graphite lube before putting it back together. The photo below shows all the pieces laid out in order. Good luck. 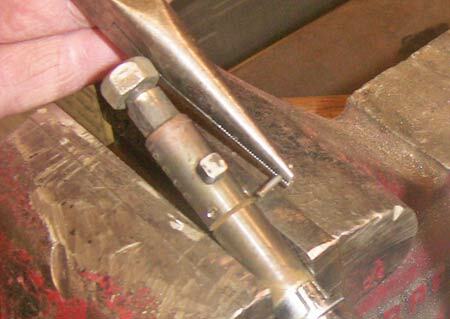 NOTE: Be careful when clamping the shaft and handle in the vise and when you are tapping and tugging on it. I believe the shaft that runs through the middle of the piece is press fit into the handle. If the handle part gets loose from the middle shaft it will not work. I had that happen on one I was working on once and it took quite a bit of engineering/machining to get it working properly again.